Sunday night saw the 2016 American Music Awards take place at the Microsoft Theater in Los Angeles. Winners on the night included Drake, Justin Bieber, Rihanna, and Fifth Harmony. The show was also stacked with performances, with Artist of the Year winner Ariana Grande teaming up with Nicki Minaj for a show stealing "Side To Side." 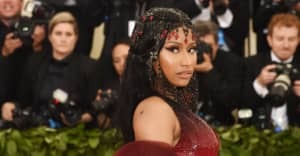 Minaj appeared twice on the night, also stepping on stage with Future, Rick Ross, and August Alsina as part of DJ Khaled's live segment. In addition to those performances, which you can see below, there were also appearances from The Weeknd, Fifth Harmony, and Lady Gaga. Check out the performances below, and check out the AMAs 2016 winners list here. Ariana Grande and Nicki Minaj, "Side To Side"
DJ Khaled and friends, "Do You Mind"
Fifth Harmony, "That’s My Girl"
Maroon 5 f. Kendrick Lamar, "Don't Wanna Know"